On Thursday, U.S. Secretary of State John Kerry announced plans to deploy a naval vessel to join NATO forces in the Aegean on a mission to combat human trafficking. Kerry told allies that the U.S. is still “finalizing plans” for the assignment, and a spokesperson for the U.S. Sixth Fleet told Stars and Stripes that the command had not yet received specific orders. NATO has deployed a force of five naval vessels and two auxiliaries to assist coast guard units combating human trafficking between Turkey and Greece, the route for the majority of the one million migrants entering Europe by sea last year. Another 200,000 have arrived so far in 2016, but the pace has slackened in recent weeks: the EU reached an agreement with Turkey for the deportation of illegal migrants in March, and the influx of asylum-seekers has declined since. In February, NATO officials described the deployment in terms of law enforcement. “This is not about stopping or pushing back refugee boats . . . NATO will contribute critical information and surveillance to help counter human trafficking and criminal networks,” said NATO Secretary General Jens Stoltenberg. However, the UK’s defense minister said that intercepting migrants would be a prominent part of the mission. “This is the first time we have seen a group tasked with returning migrants. That has not happened before. So that is quite an important development,” said Secretary of State for Defense Michael Fallon. NATO describes the mission in flexible terms, to include both intelligence-gathering and rescue purposes, with further duties as assigned. 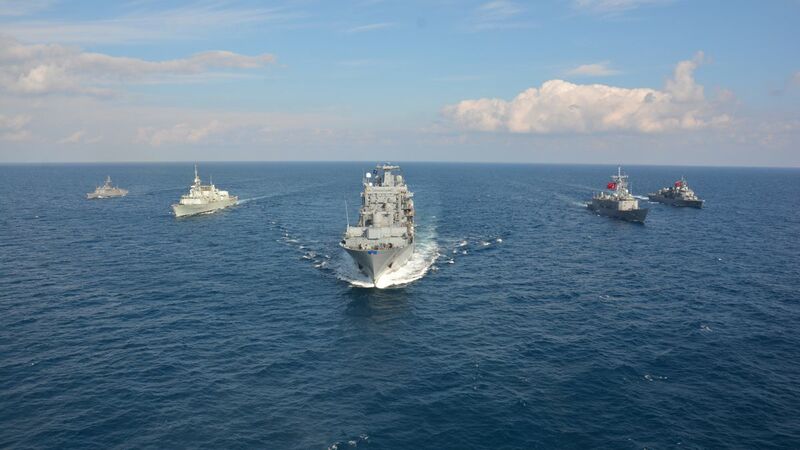 “Standing NATO Maritime Group 2 is conducting reconnaissance, monitoring and surveillance of illegal crossings in the Aegean Sea,” the organization said in a statement. “In accordance with international law, all ships that sail, including NATO ships, have to rescue people in distress at sea. Allied vessels will live up to their national responsibility to assist. Finer details of the mission itself, including its timeframe, are currently being finalized.” In his remarks Thursday, Secretary Kerry did not elaborate on the specific tasks the U.S. Navy vessel will perform as part of the NATO force.